Most of us can't afford to buy brand new rods every year. That's why it's so important to take care of our equipment, and make it last. If you are as passionate about fishing as we are, then there is no doubt that you spend a lot of money on your rods. Looking after your investment in your equipment is the best way to make sure it lasts you for years to come. What causes damage to fishing rods? Unlike a reel, there are no moving parts on a fishing rod. Instead, the wear and tear on your rods will mostly come from moving them about from place to place. Especially if you fish often, your rods are always on the move; they're moved from your garage, to your truck, to your boat, and jostled around on the road on the way to and from fishing trips. And there's no denying they can take a bit of a beating from being in your rod locker and bouncing around on your way to your favorite spot in rough water. Rods, after all, are made of thin-walled pieces of graphite. Over time, all the different types of vibrating, rubbing or direct impact your fishing rods go through can affect their strength and the longevity. When a rod breaks on a hook set, it typically breaks due to some weakness in the blank that was unknowingly caused by the angler. These little weaknesses can sometimes be microscopic. Maybe it happened when your rod fell over and hit the ground, maybe it happened when it was bundled haphazardly with other rods, or maybe it happened during a rough ride. Ultimately, even the slightest nick in the graphite blank can leave a weak spot in your rod, which will eventually leave you cursing when it inevitably breaks on a big fish hook set. 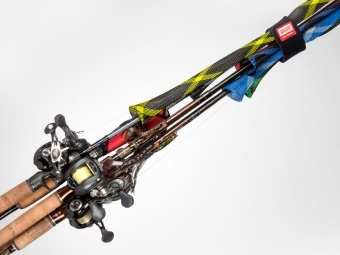 How can I protect my rods from wear and tear? The key to avoiding broken rods, lost fish, and cursing, is to protect your fishing rods from the get-go. That's where The Rod Glove comes in. The Rod Glove makes a full line of covers to protect your rods, and ultimately, the investment you have made in them. Used by most anglers, our standard Rod Gloves are made of an expandable mesh material that is super easy to put on and take off. It provides you with tip, blank and guide protection, it eliminates frustrating tangles, and it allows you to organize you rods by the wide range of colors offered. Pro Series Rod Gloves are full neoprene rod covers. They offer all the benefits of the Standard Rod Glove, with even more soft protection for your favorite stick. This series is not as easy to put on and take off, but for travel, or for the most expensive rods in your arsenal, it offers a superb level of protection. Let’s face it, most of us can’t afford to buy new rods every year. That's why we need to take good care of our equipment and make it last. Fortunately, with The Rod Glove, this is easy to do. The Rod Glove will keep your fishing rods safe, and keep them looking good, for years to come.